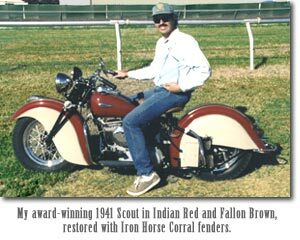 Thank you for visiting the Iron Horse Corral, also called indianfenders and indiantanks (.com). My introduction to the Indian Motorcycle came through Sammy Pierce, known to many as Mr. Indian. His fondness for the Indian Motorcycle and his devotion to putting more Indians back on the road was nearly legendary. I worked with Sammy for a little more than a year while working for the Steve McQueen estate, and during that time I became hooked on Indians. Since then, I have been making many different sheetmetal parts for shops and individuals restoring the prized Indian, always with the idea of putting more Indians back on the road. Now, any fender or gas tank you may need for a late 1934 Sport Scout, 1933-42 Fours, all the way to the 1953 80-inch Chief is available from our shop, including fenders for Sidecars and Dispatch Tows (3-wheelers). We have recently expanded our operation to also include complete sidecar bodies. We have many examples of our work shown on our Facebook page. Be sure to visit us there to check on the latest product or Indian restoration at IHC. Please feel free to call on us if you have any questions by using the Contact US page to send your inquiries. Thank you again for visiting the Iron Horse Corral.